President Obama and Canadian Prime Minister Justin Trudeau yesterday unveiled a sweeping set of climate change pledges, including a pact to cut methane from existing oil and gas wells and signing last year's Paris climate accord "as soon as feasible." Photo courtesy of AP Images. President Obama and Canadian Prime Minister Justin Trudeau vowed yesterday to spend their one overlapping year in office working to jointly cut carbon emissions and encourage the rest of the world to follow suit. The North American leaders unveiled a joint set of announcements that were more sweeping than anticipated. They featured a new commitment by both countries to put forward industrywide regulations for oil and gas methane and a comprehensive plan for the Arctic that opens the door for substantial new environmental constraints on shipping and oil and gas production in that region (Greenwire, March 10). Arriving in Washington, D.C., for the first state visit by a Canadian prime minister in nearly two decades, Trudeau played up his political similarities with Obama. "The president and I agree on many things, including, of paramount importance, the direction we want to take our countries in to ensure a clean and prosperous future," he said. Obama said they share concern for the Arctic and sea-level rise and determination to see last year's Paris climate deal implemented. But while the two liberal politicians are on the same page when it comes to climate, they're in very different places in their careers. Some advocates said they see in the Obama-Trudeau "bromance" a passing of the torch on what has become a signature issue for both men. "I think there's huge opportunities for collaboration that we haven't used for the last decade," said Merran Smith, executive director of Clean Energy Canada. "Both Obama and Prime Minister Trudeau are really interested in getting action, in doing things, in getting results. "I think Obama and Trudeau have like-minded commitments to clean energy, to climate," she said. "And even though Obama's not there for much longer, there are things he can do to collaborate and to move that agenda forward." Trudeau's D.C. trip came on the heels of meetings with provincial ministers to start work on Canada's first-ever national climate change policy. Obama, meanwhile, inaugurated his own Climate Action Plan nearly three years ago at Georgetown University. His administration has since promulgated a slate of rules and played a leading role in brokering a global climate agreement, and is now contemplating finishing touches to a legacy in the nine months before he leaves office. Trudeau said he is grateful to "draw on" what he called Obama's "experience and his wisdom as I face the very real challenges that our countries -- and indeed our world -- will be facing in the coming years." And Obama -- who was once himself panned by opponents as too young and inexperienced for the presidency -- jokingly referred to himself at one point as "an elder statesman." He said he'd advised the 44-year-old Trudeau privately to decide early in his term whether to dye his dark hair to hide the inevitable grays. "At a certain point, it's too late; you'll be caught," he said. White House officials said yesterday that the U.S.-Canada agreement would not be the last bilateral effort of Obama's term. The administration has made similar announcements with countries like India, Brazil and -- perhaps most importantly -- China. But while a few are longer-term, many of yesterday's objectives are intended to be met in 2016. In addition to the methane and Arctic commitments, the new prime minister and outgoing president yesterday reaffirmed pledges to align new greenhouse gas emission standards for heavy-duty vehicles and efficiency. They proposed to boost production of renewable energy and vowed to secure international agreements this year to phase out heat-trapping hydrofluorocarbons under the Montreal Protocol on Substances that Deplete the Ozone Layer and establish a carbon offset program for civil aviation. They also outlined a series of efforts related to the Paris Agreement, which 195 nations struck last year. The two countries pledged to work together to flesh out the deal's language creating an international market mechanism for emissions credits, which Canada negotiated. And they pledged to complete their midcentury greenhouse gas strategies this year, years earlier than provided under last year's deal. That pledge would ensure that Obama's White House writes the blueprint to effectively zero out U.S. emissions on a net basis by 2050. That's the level environmentalists say would be the U.S. contribution to the agreement's goal of keeping warming to no more than 2 degrees Celsius. The United States has promised an 83 percent reduction by midcentury, but greens say that would fall short. On a call with reporters yesterday morning, John Morton, the White House National Security Council adviser on climate and energy, said the two leaders hope other major economies will also accelerate development of their long-term strategies. "We want to lead other countries in showing that the development of those plans is a priority," he said. The strategy will be written this year by the same White House team that produced the United States' intended nationally determined contribution (INDC) ahead of Paris -- a sketch of how the Obama administration sees the United States cutting greenhouse gases between 26 and 28 percent compared with 2005 levels by 2025. Alden Meyer, director of strategy and policy for the Union of Concerned Scientists, said that the United States and Canada could provide a template other countries could use in writing their own long-term plans. "It could be quite significant, and obviously, the administration would like to do this before they leave office next January," he said, adding that it would be advantageous for Canada to develop its plan in coordination with the United States. The 34-year plan for U.S. emissions will include more details than the INDC, projecting future progress on technology development, emissions from sectors that have yet to be regulated, land-use change and agriculture, Meyer said. 'Canadianizing' lessons from the U.S.
Trudeau's election transformed U.S.-Canadian relations on energy and climate overnight. While the question of whether to permit the Keystone XL oil pipeline cast a shadow over Obama's relationship with former Prime Minister Stephen Harper for years, no such tension exists in the Obama-Trudeau relationship. "I want to assure the American people that they have a real partner in Canada," Trudeau said yesterday. The Canadian leader's support for the Alberta-to-Texas pipeline did not come up yesterday, despite Obama's move to block it. And neither commented on U.S. Secretary of State John Kerry's statement the day before that no new pipelines would be needed to transport petroleum across the U.S.-Canadian border. Trudeau's visit came after a meeting with provincial leaders in Vancouver, British Columbia, to begin work on the country's first national climate policy. Ministers set the goal of keeping post-industrial warming to "less than 2 degrees and to pursue efforts to limit it to 1.5 degrees" Celsius -- an aspirational target enshrined in the Paris deal. "We've certainly never had that level of consensus before," said Erin Flanagan of Canada's Pembina Institute. Federal and provincial officials now have six months to craft proposals in four areas -- clean technology, innovation and jobs, carbon pricing and mitigation -- with the goal of finalizing the package at a summit in October. Trudeau's hope of a nationwide carbon pricing floor has met with opposition, but 80 percent of the country's population is already covered by non-federal carbon pricing programs. Canadian environmental and energy policy is frequently set by the 10 provincial governments rather than at the federal level, which is why provincial buy-in is so key to this pan-Canadian climate effort. In fact, British Columbia's announcement last week that it would follow Alberta's lead and promulgate oil and gas methane restrictions seems to have allowed Trudeau to join with the United States yesterday in committing to regulate the sector. The United States under Obama has moved the ball further than Canada under Harper in many of the areas outlined in yesterday's accord -- a gap greens say Canada could quickly close. U.S. EPA is already set to finalize rules for new and modified oil and gas operations this spring and pledged yesterday to start work on rules for existing ones. But it is doubtful whether the agency will finish that work by the time Obama exits the White House next January, leaving existing operations in the United States unregulated. Meanwhile, Trudeau's government should have little difficulty in following through on its regulatory agenda now that the country's two highest-producing provinces are on board. "This is a good, quick win for Trudeau," said Drew Nelson, senior manager of natural gas at the Environmental Defense Fund. He added that Canada could surpass the United States if the latter takes too long to regulate existing sources. North American action could spur other countries to also curb their petroleum methane leakage, he said, doing as much to contain warming as if the world shuttered one-third of its coal plants. Canadian greens spoke approvingly of EPA's Clean Power Plan and last year's extension of tax credits for renewable power -- policies that have boosted the U.S. green energy industry while the same industries have stagnated north of the border. 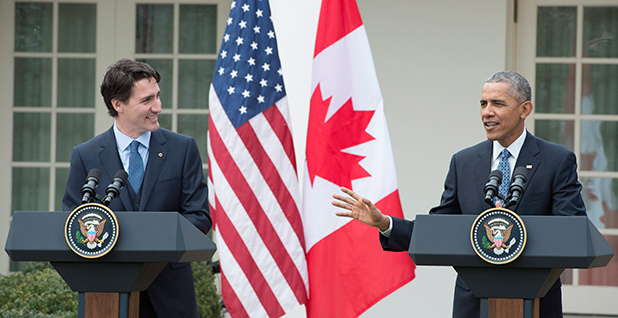 "This meeting with President Obama, the timing is great, because your country has made some great steps forward on climate action," said Clean Energy Canada's Smith. "There are things for Canada to learn, and some of them we can emulate. We can Canadianize them, as need be." Coordination between the two countries can help Canadian producers sell their product in the United States, which will also help ease the cost of Clean Power Plan compliance, she said. But U.S. climate policy could change dramatically if Republicans win the White House this November, leaving the two neighbors again at odds. Obama said yesterday that presidents generally follow through on international commitments made by their predecessors, even of a different party. "As somebody who came in after an administration that politically saw things very differently than I did, what you discover is that -- for all the differences you may have in your political parties -- when you're actually in charge, then you have to be practical," he said. He followed through on agreements reached under the George W. Bush-era, he said, even if he wasn't enthusiastic about them. "But you're always concerned about making sure that the credibility of the United States is sustained," he said. But Republicans on Capitol Hill and the campaign trail have targeted U.S. involvement in the Paris Agreement, saying it should have been submitted to the Senate for its advice and consent. And EPA's bid to regulate more sources for petroleum methane is also likely to raise GOP hackles, especially if a Republican president enters the White House before the rule is final. Senate Environment and Public Works Chairman Jim Inhofe (R-Okla.) said the methane rule sounded like another effort "to finish off fossil fuels." Senate Energy and Natural Resources Chairwoman Lisa Murkowski (R-Alaska) said it isn't needed, as the industry is already making strides to conserve its product. "They're making efforts to rein it in, and we're seeing the benefit. And so now what we're going to have is these new regs, undefined, but a top-down approach that has never really been that helpful. So yeah, I'm worried about it," she said. Sen. John Hoeven (R-N.D.), a staunch supporter of the now-defunct Keystone XL project, laughed off Kerry's comment that no new pipelines are needed. "Of course we need to continue to invest and upgrade and have more energy infrastructure," he said. "That's how we get our country to energy security." Reporters Pola Lem and Camille von Kaenel contributed. How will this week's climate announcement between the United States and Canada affect the global momentum on cutting greenhouse gas emissions? On today's The Cutting Edge, ClimateWire reporter Jean Chemnick discusses the next steps for the United States as U.S. EPA runs up against a tight timeline to move regulations to limit methane emissions from existing oil and gas operations. Click here to watch E&ETV's The Cutting Edge.